A magnetic storage rack is a simple and easy way to keep all those drill and driver bits you may have laying all over the shop. In fact, the type of magnets that I used in this build are strong enough to hold not just drill and driver bits, but screwdrivers and a 16oz hammer. This is a quick and easy way to keep all those small metal pieces from getting lost in the void. Their is an alternative design that I spoke about in the video. It is called the DIY: Drill Bit Storage Cabinet. You'll find a cut list and materials waiting for you on the other side. 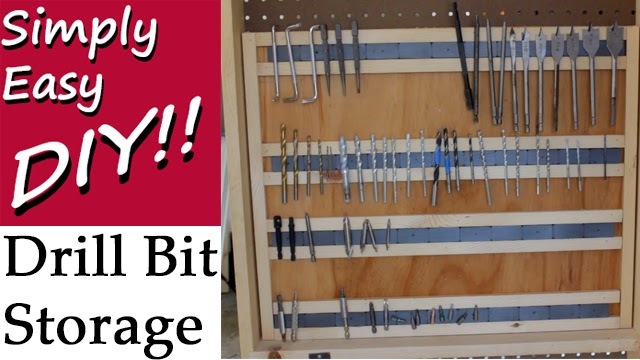 DIY: Magnetic Drill Bit Storage Rack - Driver Bits Too! 1 - 1/4" sheet of plywood @ 24" x 18"
2 - rear horizontal frame pieces @ 1" x 3/4" x 22"
2 - rear vertical frame pieces @ 1" x 3/4" x 18"
2 - front vertical pieces @ 1" x 3/8" x 18"
8 - front horizontal pieces @ 1" x 3/8" x 22"
The magnets I used are very strong and I was extremely pleased with them. I tested out a few other items in my shop such as a few screwdrivers and a 16oz hammer. They held each firmly in place. I used ceramic magnets that can be found here: CMS Magnetics® Ceramic Magnet 1 7/8 x 7/8 x 3/8" for Kids' Science and Physical Therapy, 50-Counts . Be careful using magnetic tape for this project. Most of those are for lightweight holding applications. Drill bits would seem to fit the definition of "lightweight" but they are also round. A stronger surface gauss rating is required to firmly hold round items onto a flat surface. You might get away with some of the smaller and lighter drill bits, but larger ones will not be held firmly. Depending on where you place this drill bit storage rack, the pounds of pull may not be sufficient to overcome inertia from opening or closing a cabinet. Vibrations are also common in a workshop setting and you do not want your drill bits to vibrate to the floor. In my opinion you need a medium strength magnet at least. I had tossed around an idea for an alternative design to this board style drill and driver bit storage rack. I'll update this post when I publish the design plans for that. Check back soon. Looks great, can't wait to try and build it! Thanks for sharing.